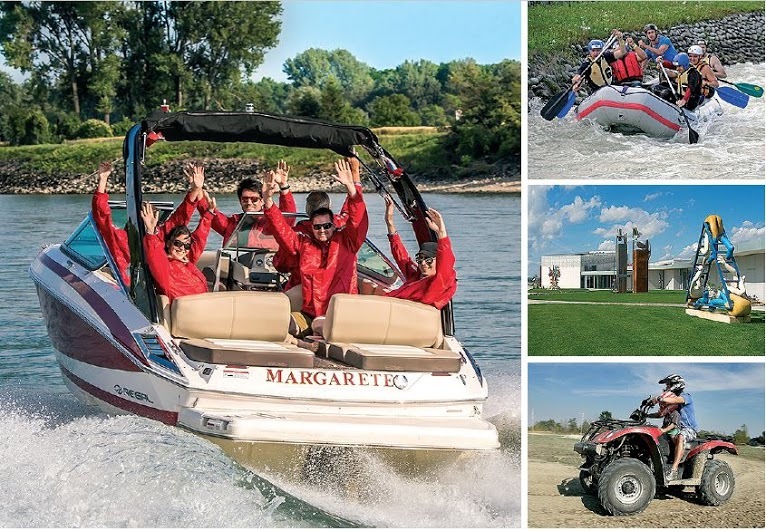 If you want to experience some adrenaline on the water, try one of our untraditional sporting activities or reveal the beauty of modern art on the Danube, this is the right choice for you! SPEEDBOAT CRUISE Welcome aboard Speedboats.sk! We will dress you up in waterproof capes and head out for some adventure. Downstream the river Danube we will be passing by the holiday destination preferred by the locals. Surrounded by beautiful countryside and hiding from the city rush, you will see beautiful houseboats. Your journey will be accompanied by flocks of swans, wind in your hair, a smile on your face, water drops and foaming waves behind the boat. WHITE WATER PARK DIVOKÁ VODA With our speedboats we will take you to the white water park Divoká voda, where our Olympic winners and world champions in water slalom grew up. We can kit you out with neoprene wet suits and you can try rafting, one of the most attractive watersports full of adrenaline and fun. There are also other activities such as a surfing, jet ski, aqua roller, paintball or pony riding. DANUBIANA GALLERY If you’re tired, you can take a rest only a couple of minutes from the water area. At the meeting point of three neighboring countries – Slovakia, Austria and Hungary – is a peninsula with one of the youngest European museums of modern art, which offers a unique combination of art, nature and architecture. In the building of the gallery and a park with 8 000 m2 you can view sculptures from Slovak and international artists, which acquire a different perspective in their contrast with greenery, the water’s surface and the distant panorama of the city. Sport activities must be reserved in advance. Don’t forget your swimsuit and towel! Alongside the river Danube Duration 2 pers. 3 pers. 4–6 pers. € 127/p. € 85/p. € 63/p. Price does not include: sport activities (from €35/p. ), Danubiana galleryentry €8/p. Private tour & sport activities upon request. Bookin necessary.